The Renard Artist Model 220 by Fox is acoustically patterned after the Fox Model II. 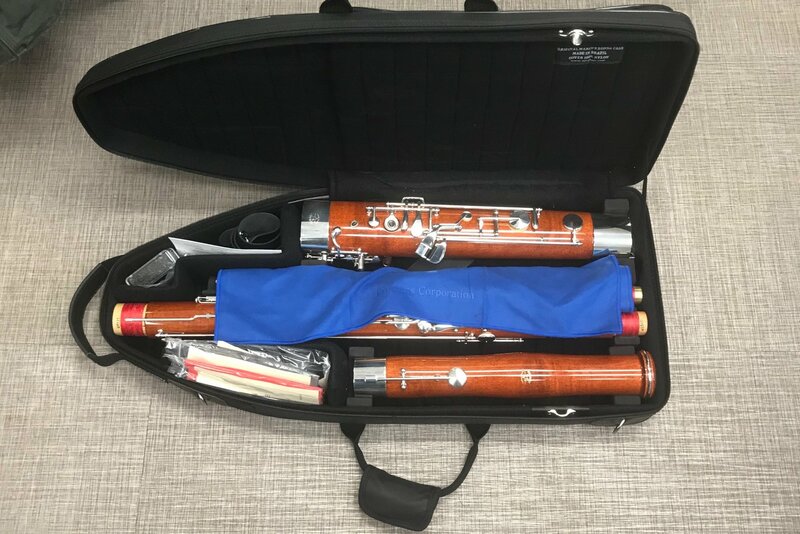 The secure performance and superior intonation of the long bore design will provide excellent performance for advancing school bassoonists. This model was introduced in 1972, and has a very warm tone and evenly balanced intonation throughout the entire range. Like all of the Renard long bore designs, it features an intonation guarantee. The body is constructed of black maple (long bore), that is naturally aged in Fox/Renard’s own facilities. It also features liners in the wing joint and small bore of the boot joint. A French bell and body lock are standard. Finished with an acrylic enamel. The Renard 220 features nickel silver keys with silver plating, a Full German system with additional high D and high E keys, and a ring key for wing joint third finger hole. Rollers on F, Ab, Eb, Db. This model also includes the "Pro" U-tube! Includes modern Fox case. EACH BASSOON RECEIVES OUR PROFESSIONAL SET UP AND IS INSPECTED AND EVALUATED ON AN INDIVIDUAL BASIS. INCLUDES 1 YEAR GUARANTEE ON ALL PADS, CORKS, FELTS AND ADJUSTMENTS.